Latitudes: Hear Great Global Music Right Now, With A World Premiere This music crosses continents — hip-hop from India, French club music born in Kinshasa and a Yemeni Jewish lullaby. A timely premiere features Sean Lennon and a Pakistani jazz group. Guitarist Asad Ali from the Sachal Ensemble of Lahore, Pakistan. It was five years ago that an unassuming — and highly unlikely — band became the toast of the jazz world. 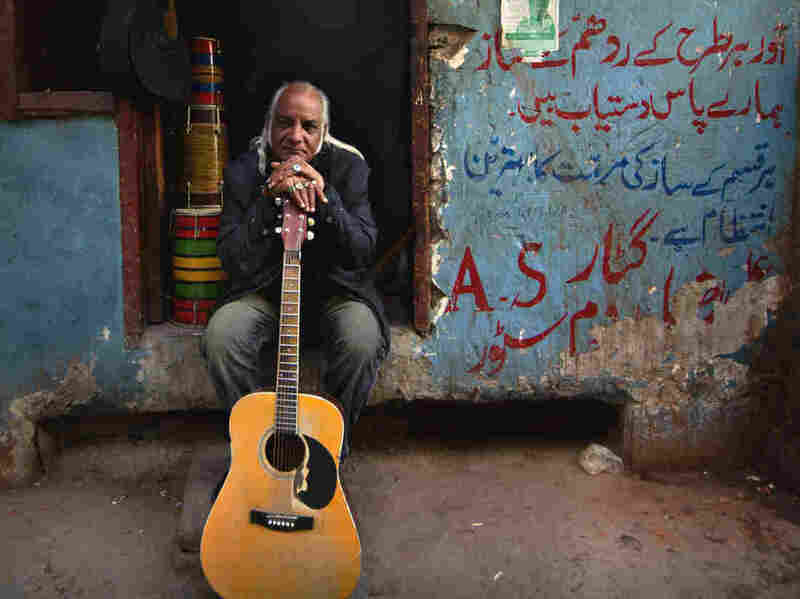 Pakistan's Sachal Ensemble includes studio musicians from their country's once-healthy film industry, which began to decline in the 1970s in a wave of political and religious pressure. With their audience at home close to eviscerated, the members of the Sachal Ensemble and their champion and impresario, banker Izzat Majeed, were casting about to find some way of appealing to an international audience. They wound up blending distinctly American jazz with South Asian instruments like sitar, sarod, tabla and dholak along with Western instruments that had long been incorporated into local music, like violin and guitar. The group's road to a 2013 collaboration with Jazz At Lincoln Center became the subject of a documentary film, Song of Lahore, which will be in theaters in May. Along with the documentary, an album featuring the enemble with many well-known American guest artists, including Wynton Marsalis, Nels Cline, Jim James, Susan Tedeschi and Derek Trucks, and Meryl Streep. On this track — premiering here on NPR Music — the Sachal Ensemble works with Sean Lennon on a cover of Nick Lowe's "(What's So Funny 'Bout) Peace, Love and Understanding," a song made famous by Elvis Costello. Perhaps unsurprisingly, their collaboration rides a rather George Harrisonian psychedelic wave. The Easter Sunday bombing in Pakistan took place in the Sachal Ensemble's hometown of Lahore, in an act of terrorism that seems to have been intended as an attack particularly on Christians there. The musicians' work and this song in particular feel all the more tragically timely. An Indian rapper named Divine (a.k.a. Vivian Fernandes) has made something of a cottage industry in repping the harder-edged neighborhoods of his hometown, Mumbai — light-years away from the playgrounds of India's super-wealthy. The beat and backing tracks on this new song, "Jungli Sher" (Jungle Lions), tip toward the bombastic. But Divine's flow is packed with brilliant internal rhymes and trenchant observations like "Hope is the rickshaw of the poor/on which the rich cruise." (To catch the translation, turn the subtitles to "English [United Kingdom]".) The video's visuals, shot via iPhone, are just as scrappy as the lyrics. The Congolese-French singer and rapper known as Maître Gims (Gandhi Djuna) has a brand-new ballad featuring Sia called "Je Te Pardonne" (I Forgive You), out this week. It's already been viewed on YouTube well over 2 million times. That's a big ballad, but I still prefer the thoroughly African beats of his smash-hit ode to well-dressed men called "Sapés comme jamais" (Dressed Like Never Before), featuring fellow rapper Niska. Being a sapeur — that is, an adherent to the Société des Ambianceurs et des Personnes Élégantes (The Society of Ambiance-Makers and Elegant People) — is a way of life for a certain stratum of Congolese men. And that is something that Maître Gims can claim as part of his heritage. His dad, Djuna Djanana, was a band member for Congolese rumba legend Papa Wemba, the artist nicknamed "Le Pape (The Pope) de la Sape." By this time, it's no secret that I've become a big fan of the trio of sisters who call themselves A-WA: Tair, Liron and Tagel Haim. They come from southern Israel and draw deeply from their Yemeni Jewish roots, not just in terms of the language they sing in — Yemeni Arabic — but also in their particular aesthetic. They frame their tradition with thrillingly up-to-date sounds and ideas. So I was thrilled when they agreed to a late-night meetup with the NPR Music crew at SXSW this year to perform a lullaby of sorts, an achingly sweet love song, sung in Arabic and in three-part harmony, called "Ya Shaifin Al Malih."